Mobile Ecosystem is collection of multiple devices (mobile phones, Tablet, Phablet etc), software (operating system, development tools, testing tools etc. ), companies (device manufacturers, carrier, apps stores, development/testing companies, etc.) etc., and the process by which data (sms, bank transactions etc. ), is transferred/shared by a user from one device to another device or by the device itself based on some programs (Birthday, Wedding Messages, calendar). Data (Text, MultiMedia, VOICE) sharing can be done between devices of the same operating system or different operating systems. Examples: IPhone (IOS) to Windows Phone or IPhone(IOS) to Nexus(Android) or Motorola(Android) to Nexus (Android). Data can be also shared between multiple devices with the same operating system of the same manufacturer. Example: Apples: IOS: Iphone, Ipad, to Ipod, TV, Laptops. Mobile is manufactured with necessary software and applications. Users buy phones and subscribe to plans with carriers. If needed, buys/uploads applications for the device. From time to time, new applications or features are uploaded or upgraded in the device as and when the need arises. This is the important component of a Mobile, which controls/operates all applications that are residing on the mobile phone. Android is open source and IOS is a closed source. Example: IOS, Android, BlackBerry OS, Symbian, Bada etc. Android Applications are developed with Eclipse, Intellij Idea etc. BlackBerry Applications are developed with Eclipse etc. IOS Applications are developed with XCode, MonoDevelop, AppCode etc. Windows Phone Applications are developed with Microsoft Visual Studio etc. Please go to relevant websites to get more information on each Tool. Actual device (mobile) operations and functions are simulated on to the computer. Instead of buying several devices (Motorola, Samsung, Micromax etc), we can use emulators for functional testing. Network Connectivity, resolution testing etc cannot be tested 100% with emulators. So for testing to be 100% perfect, devices are needed and again buying several devices will be very costly. For this, you can go to Mobile Cloud environment companies and rent those mobile phone. Companies rent mobiles and other devices virtually at hourly or weekly basis or monthly basis etc. Applications can be tested by subscribing to those companies. Jamo Solutions, Perfecto Mobile, Device Anywhere Pro. Application created can be uploaded in stores after getting approval from those stores and applications can be sold. Applications can also be downloaded at free of cost or on paid basis. They display advertisements on the mobiles. Example: Google’s AdMob. Carriers carry Voice data (calling), text data (sms), and multimedia data etc from one device to another device through Networks. Users subscribe to different plans available with Carriers. 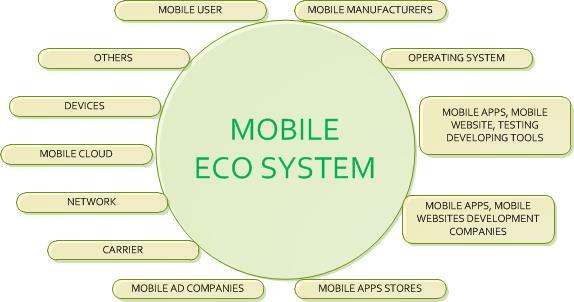 tagged with mobile ecosystem diagram, mobile ecosystem examples, What is Mobile Ecosystem?